In the spirit of the game I hereby propose a minimum 30 day truce for declaring war after a server wide tourney. Unless of course there were extreme circumstances that would require such action. Planning and declaring a war after player sponsored tourneys isn't "on a whim" or "extreme circumstances." We can omit "extreme circumstances" if everyone abides by the 30 day truce. In the spirit of the game? You can't be serious. Nobody has trampled the goodwill of tournaments more than Valiant Crow. 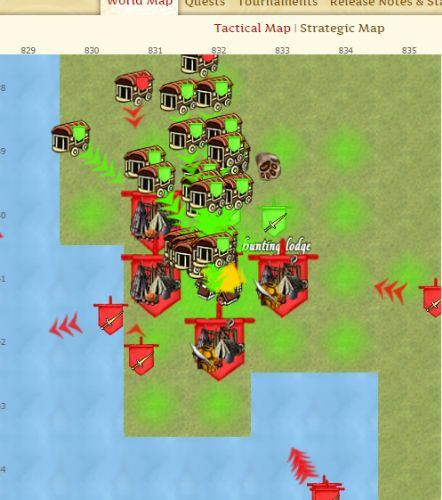 In the last tournament, vCrow used battlefield tactics like weaponized cities to solidify square dominance. The implied threat is clear--touch the city and risk a war with the #1 alliance, or back down and concede the square. You can't deliberately blur the line between war and tournament, and then complain because an adversary blurs it further. I tell all the Loki newbies to figure out what they wanna be when they grow up in response to their queries about where they should exodus to or how they should build their cities. When they ask what I mean I tell them that they can be traders, crafters, npc harvesters, pvpers, or some combination thereof, or all of the above. I tell them that if they want to specialize in one particular thing they can be really good at it, but at the expense possibly of the speed or strength in another thing. For example, if they wanna be a military player and they wanna go with a 5-5-5-5-5 type res distribution with high troop sov they can crank out troops super fast, but at the expense of having a higher population or more cities or more gold from taxes. If they wanna grow big and huge with 20 or even 40 cities then they need the 7 food tiles and that will come at the expense of being able to crank out the 400% or better troop sov. It's a balancing act, a give and take. Be "pretty good" at everything, or be "freaking awesome" at one thing. So here's my advice to you just like the newbies... if you want to be the #1 tournament alliance, then you're going to have to be #2 (or #3, etc.) somewhere else. You can't be "freaking awesome" at everything, the game doesn't work like that. You can't change the server to keep your undisputed strength in one area while also removing your weakness in another. If you want to win a tourney do it, go all in, but understand that another alliance may be going all in for a war instead. If you want to be strongest in war, go for it, but that means another alliance will sweep the tourney out from under you. It's a balancing act, a give and take. Pick your path and be the best at it. This is a proposal/game suggestion for the future regardless of what has happened in the past. Attacking/defending player cities vs. tourney squares are very different things. I'm not sure what you mean by using weaponized cities in a tourney since any weapons would have to be used and lost on a square in the tourney. As far as I know vCrow has never declared war over tourney squares. I'm not sure what you mean by using weaponized cities in a tourney since any weapons would have to be used and lost on a square in the tourney. As far as I know vCrow has never declared war over tourney squares. vCrow moved multiple cities directly adjacent to tournament squares. For any square vulnerable to a specific attack type, the adjacent city undermines the "clear big, hold small" strategy for all other alliances. The classic example is a plains square, where large cavalry armies clear, and people typically hold with 1-60 troops. With a city adjacent to the tournament square, it is trivial to pick off small occupying armies with elite commanders. In order to restore any semblance of tactical balance to those tournament squares, the other alliances would have to remove the adjacent cities. Sieging a city is typically interpreted as an act of war. So placing the city adjacent to a tournament square presents your opponents with the choices of eating massive casualties, conceding the square due to the asymmetrical tactical advantage, or attacking the city (and risking a real war declaration over a tournament square). Advancing a city in such an aggressive manner is a tactic commonly employed in PvP wars. Such a beachhead allows the dispatch of siege engines from close range, which shortens the time between siege launches, cuts warning times down considerably, and holds entire areas in jeopardy of siege. In short, a weaponized city. Contrasted with a typical city used for account growth and traditional purposes. Using weaponized cities to dominate tournament squares is a valid meta-game tactic. But it blurs the line between tournaments and warfare. Your proposed 30-day cooldown between tournaments and war declarations implies that there is a protected nature to tournaments. There isn't. Especially not when your alliance is using battlefield tactics to tip more tournament squares in its favor. If someone has an issue with you then them declaring war or not is irrelevant. They can attack you just as easily with out a declaration as with one. Going to war with someone after a tourney, imo, is a pretty cheap move in the same way as it would be to declare on someone right after they have been to war with someone else. However, I also think that if you are going to war then you need to seize every advantage you can so I can see why people do it and would probably do it myself if I was ever put in that situation. For anyone who thinks vCrow was really low on troops, I have some prime real estate in Farshards to sell you. I see your point, being closer to the square is a strategic advantage. I don't see how that's blurs the lines of war since anyone is free to move their city near the square as well... Unless of course there are "land claims." Don't tourney squares move now?